Locating itself on the boundary between poetry and fiction, In This Alone Impulse is beautifully replete with silence. One has the sense that the world outside is still there but dampened, and being reordered and reformed by the particular and peculiar logic and structures that these syntactically inventive prose blocks have. And yet, despite the formal concerns these pieces seem remarkably human and remarkably painful, opening up the blank avenues of a lone life. With each reading these pieces change, seeming less and less enigmatic and more insistently full of lyrical human meaning. A marvelous and original sequence; there’s really nothing else out there like it. 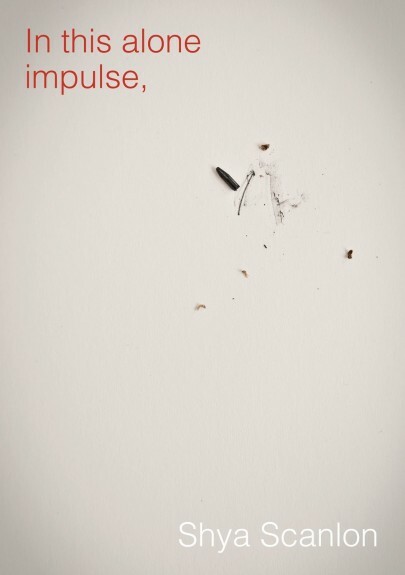 Shya Scanlon is the author of the poetry collection In This Alone Impulse (Noemi Press, 2009) and the novel Forecast (Civil Coping Mechanisms, 2012). Shya received his MFA from Brown University, where he was awarded the John Hawkes Prize in Fiction.